@Brass-Man I don't mean to imply that I think doing this is unethical at all... even by moving to unenforceability. I just do think it is unenforceable, so any talk about a rule is moot. And anyway, the solution to every problem isn't just to ban it. Here is a perfect example of why... even though I agree with you that it isn't against any rule and isn't unethical. The integrity of a game is important but it's not of the utmost importance. Logistics matter. Promoting the game and the format matters. For many players and spectators, learning and improving as players matters. @ajfirecracker You coached Oestrus on stream to a 4-0 finish in a daily. She literally did not make game actions until you chimed in. This directly impacted the players in that event and I'm guessing you didn't give it a second thought at the time. Rather than focus on your hypocrisy, I would rather focus on what was gained from streaming. She learned, you and the other viewers got entertainment out of the experience, and the vintage and online community benefited from an additional player and content contributor. I stream occasionally and intend to continue because I believe it benefits the community as a whole and is something I enjoy. At the same time, I accept that players may be streaming against me or ghosting. I disagree strongly. I would much rather be called out for hypocrisy (see my opening statement in this thread) than dismiss my argument because of my actions. If my actions and my beliefs are in conflict, it is my actions that must change. I think that despite the value of the video content we produced, it was ethically questionable to enter a tournament with the intention to have 2 players control a single account. I think that ethically questionable status becomes more severe in a premier event like the Power 9 Challenge, and less severe in non-tournament play such as Practice room matches on MTGO. @ajfirecracker On a side note. That stream with Oestrus was one of my favorite streams of the year. It was great to see a newer player getting into vintage, and great to see you helping. You should be really proud of that. I don't think that was unethical at all. I do think it was great. I have no dog in the fight. I haven't played MTGO in 6 months and I never streamed. Just giving an example. The difference in the Mystical Tutor case is that there are two documents, the Infraction Procedure Guide and Magic Tournament Rules, that explicitly bar players from getting outside advice during a paper magic tournament. These documents a set of rules for paper play, and they don't apply to Magic Online. You can't blanket apply these rules to MTGO because most of them would be nonsensical (stalling isn't illegal on MTGO, you can't call a judge on MTGO, you can look at your draft picks on MTGO, etc). The MTGO equivalent of those documents is the User Agreement, which is quoted earlier in this thread. That document is unclear on outside assistance, people in this thread have interpreted it in different ways, and I think that's fair (though I think you can infer from Wizard's actions how they interpret it). Just as I wouldn't expect my opponent to follow Hockey-specific rules in a paper -magic tournament, I don't expect my opponents to follow paper-magic specific rules in an MTGO tournament. It's clear from this thread that not everyone feels this way. This is a cute little slam on everyone who disagrees with you. I came out explicitly and said I thought your behavior was legal but should be made illegal, which dodges this entire criticism. Whether team play is currently legal is almost entirely a separate issue from whether it should be legal in the future. I really wasn't trying to slam people - I get that this stuff is unclear. I've had this conversation outside of this thread, too, and I know that some people think that players should follow all paper rules on MTGO, even though I don't. I think I understand your point, "it's not illegal, but I think it should be, and I won't do it myself" (if I'm misreading you, let me know). I can absolutely respect that viewpoint even if I don't agree with it. Unfortunately this thread ended up being about 3 or 4 related but different topics - is it illegal now? is it unethical? should we take steps to make it illegal? does it make sense, in the abstract, to have unenforceable rules? (iii) Collusion A player or players working together to gain an unfair competitive advantage in an event. An example of collusion includes sharing knowledge of draft picks with other players of an event during the drafting portion of that event. The grey area is when it's other players in the same tournament who have access to information not available to anyone else. Scouting in paper tournaments is a bad analogy as anyone with a bit of time can do it. Whereas in a Modo event as far as I know the only way to know for sure what deck someone is on (before you've played them) is for them to tell you themselves or someone else to have faced them in a prior round and then pass that information on. But even then who is to say that the advantage gained is unfair? It's an edge and very difficult to say how such edges add up. I also completely buy that you could do this outside of a stream it and would be undetectable. And it would be the wrong outcome if someone was sanctioned for collusion as a result of something someone sat beside them said or was posted in the chat that was caught on stream. This would discourage an activity that is of great benefit and service to the community. So I've reconciled myself that while my opponents may have an edge (streaming, teaming or otherwise) it didn't detract from me having fun - which is the main reason I play. Having been on the other side of this in a previous P9 challenge, I must admit it was originally somewhat disheartening to watch the replay and discover that I was facing down 2 players, plus a third over Skype. That said, I know that I personally got a lot out of being able to re-watch that match from my opponent's point of view; to hear the considerations of his lines, see what he had, and especially to hear the debate between different lines. It was a wealth of valuable information that you just cannot get anywhere else. I was able to easily pick out my (very) loose plays, see where I had my windows, and when they closed. I lost the match, but was able to get a heck of a return on that loss. My two cents: I definitely wouldn't want to see an end to the way that Vintage has been streamed recently -- the community, entertainment and educational value provided is far and away worth more than the occasional feelbads. I do not care that my opponent was receiving outside help, but this is almost comical. I disagree strongly. I would much rather be called out for hypocrisy (see my opening statement in this thread) than dismiss my argument because of my actions. If my actions and my beliefs are in conflict, it is my actions that must change. As far as I'm concerned, this thread has reached the end of it's usefulness (just like the previous version of the thread). @ajfirecracker If you strongly feel this way, talk to Wizards about establishing a code of conduct for streamers. That would be the most productive use of your time. I'm ignoring this thread now. @diophan I have to admit, I'm really uncomfortable with you using me, and my stream to go after someone. Not to mention that you picked a horrible picture of me to go along with it. To be clear, Adam was not the special guest tonight. He was simply a viewer, along with many in my chat. I did not ask for his suggestions, nor did I need them. @Oestrus's stream is fire and I recommend people tune in. Lesbimagical was also a great guest, and I can only admire their righteous anger at dredge hate in general and white eldrazi in particular. I just want to make one thing perfectly clear. I was very intentionally not providing useful play advice in that stream. I think @diophan's screenshot is incredibly misleading. I purposefully did not say Strip Mine indicated against Workshops until after @diophan played a dual land. I purposefully did not say to play Dark Depths (as the only possible land play in a given turn) until after the streamer passed the turn. I purposefully did not say that Dakmor Salvage is a Dredge 2 and can't be dredged with 1 card in library until after the streamer was committed to that line. 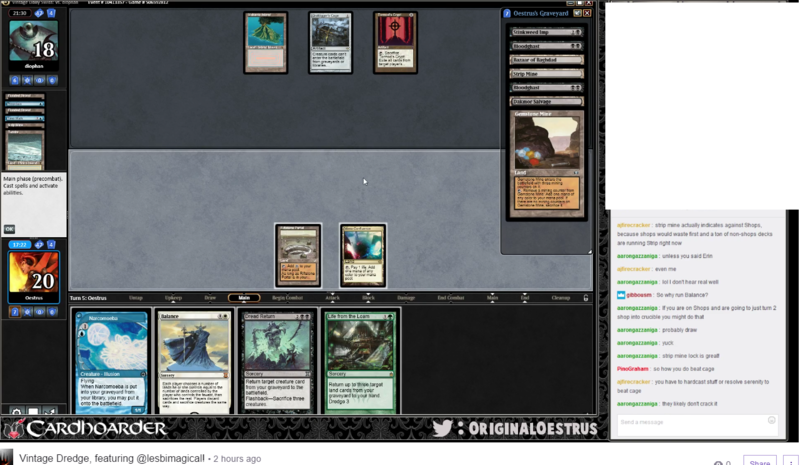 There was one case where I said to hardcast a Prized Amalgam, thinking the streamer had already come to a decision and was moving on, and the streamer ended up seeing my message and ended up playing the Prized Amalgam. So, if you want to highlight my hypocrisy, that's the only instance that I am aware of. I don't think you understand my point. You made a general comment that you have to "hardcast stuff or resolve serenity to beat cage" in the middle of game two. Unless you made this comment at the end of the match, you are providing outside assistance, regardless of where your comment was directed. Especially since there was a cage in play for IIRC half an hour of the remaining match time. That advice is useful as long as the game is going on. Just because your advice is general does not mean it is not outside assistance. You are making up rules as you go along to make your behavior ethical while smearing other people (including Oestrus by the way) for being provided assistance in person or via Skype. Providing less outside help than you could have is not a tenable ethical position. It would be nice if we could all just agree that streams like Rich's, Oestrus's, and Brassman's benefit the community and part of streaming is communicating in near real time with other people. Your actions certainly imply you see the value of people streaming. @diophan Read your screenshot again.